Documentary footage of soldiers killing five Taliban fighters in Helmand Province has gone viral once again. The five minute clip is currently top of Reddit Videos and shows a firefight between Danish soldiers and the extremists who the squad find while out on patrol. During the chaos of the fight, the soldiers toss a grenade into a ditch where the Taliban fighters are hiding, followed by the order to ‘neutralise them.’ Gunfire is then heard. All five of the Taliban fighters are killed in the fight and we see distressing scenes of the extremists’ bodies lying in the ditch. 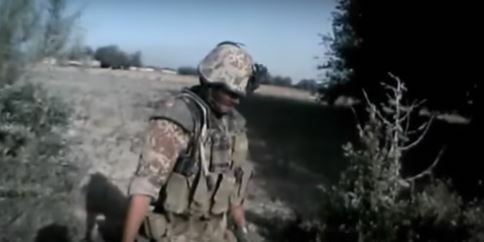 The video comes from the controversial documentary Armadillo which follows a group of soldiers from the Guard Hussars Regiment on their first mission in the infamous Helmand Province near a base named FOB Armadillo. Armadillo received a lot of criticism when it was released in 2010, accused of blurring the lines between reality and fiction. While the footage is expertly photographed, all the different uses of filters and postproduction colour correction (to say nothing of the superb sound) – which gives the film an almost Apocalypse Now quality at times – is disturbing when we’re talking not about the mythology and madness of war, but about showing real, dead people in a ditch or actual children running from fighting. After the film premiered, the Danish Socialist People’s Party accused the soldiers of breaking the rules of engagement during a firefight and demanded an investigation, in which the soldiers were cleared of any wrongdoing.